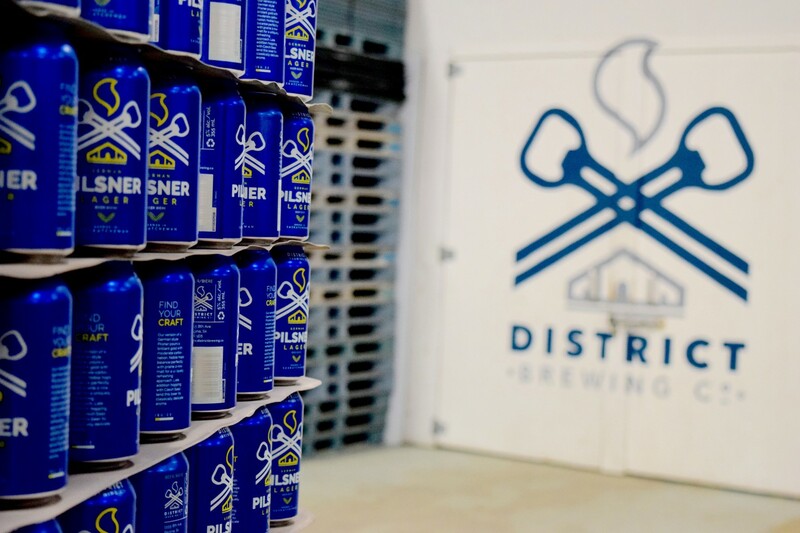 Did you know that District Brewing Co. cans it's own beer? Recently, I spent a few days at District Brewing Co. in Regina to learn about the process of brewing and canning. I felt like I was in a real life episode of “How it's Made”. It didn’t take long to realize that it involves a lot of hard work, but it was such a fun experience! The brewery is filled with stainless steel tanks and a state of the art canning machine! The canning process itself is quick and efficient but you need a team to ensure quality control. This team makes sure the cans are filled to the appropriate amount, sealed properly and packaged correctly. The Brewmaster, Jay, is also present during throughout the process to ensure that each beer represents the excellence and consistency expected from a specialized craft beer. I learned that once the you start emptying a tank, the work doesn't stop until every last drop has been transferred...roughly about 10 hours each day. Luckily, every once in awhile a can will realize its fate and decide to fight its destiny. This causes it to get squished in the machine and requires a quick halt (and well deserved break) in production while it's being removed. Despite the long hours and tough work, it was fascinating watching it come together from start to finish. Also, there is nothing more awesome than tasting a freshly-canned beer right at the end of the canning line.